The ScanPyramid project recently caused a sensation: in the prestigious journal Nature, a team of researchers bringing together numerous scientific partners including Inria revealed the existence of a big void within the Khufu (Cheops) Pyramid in Giza. However, one question still remains: how can cavities of this kind in monuments (pyramids, painted caves, monuments from the Antiquity, etc.) be explored leaving as few traces as possible? The Larsen researchers are currently developing two further robots. The first, made up of a tube housing a rotating camera, will be able to conduct a preliminary inspection by providing a high-definition panoramic view of the cavity. If required, the second robot will then carry out the actual exploration. 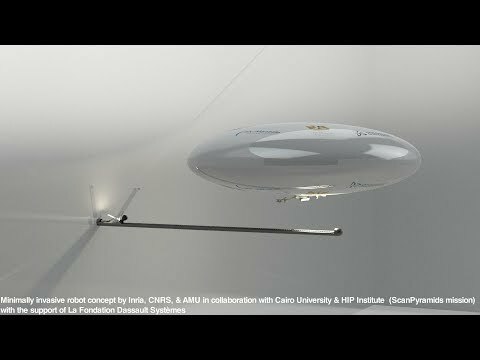 For this robot, the researchers are opting for the concept of a remote-controlled mini-airship which, after having been inserted through the same hole, could be inflated with helium in order to navigate around the rooms. “The fact it can fly makes it possible to overcome all of the obstacles on the ground that make exploration complicated, such as stairs or debris”, Jean-Baptiste Mouret explains. Tiny quadrotor drones are also conceivable; however they present serious challenges with regard to autonomy and stability in flight, compromising the taking of clear photos. “A mini-airship, on the other hand, does not require engines to keep it in the air, has good stability and better safety with regard to the monument as the risks linked to a collision are lower”, the researcher underlines. Nevertheless, such an approach requires major challenges to be addressed, such as the integration of an array of sensors, mechanical systems and an inflation system in a capsule that is only three centimetres long. To overcome these, the Larsen team has already developed several prototypes and multiplied test flights. Using an interdisciplinary approach very dear to Inria, the robot and the sensors - essential for the semi-autonomous orientation of the robot - are developed in close collaboration with the Institute of Movement Sciences (CNRS - Aix-Marseille University). Franck Ruffier (Biorobotique team) and his colleagues have a solid expertise in 'bio-inspired' sensors, imitating the ability of flies and bees to fly in an obstructed space whilst using very low cognitive capacities. These sensors work by measuring the speeds of the objects on the retina, simple algorithms then making it possible to get into position depending on each of them without having to resort to imposing 3D processing. “Embedded in the drone, these sensors would enable them to find their way in space and to land accurately on the docking station, even in the event of a loss of contact”, Jean-Baptiste Mouret predicts.